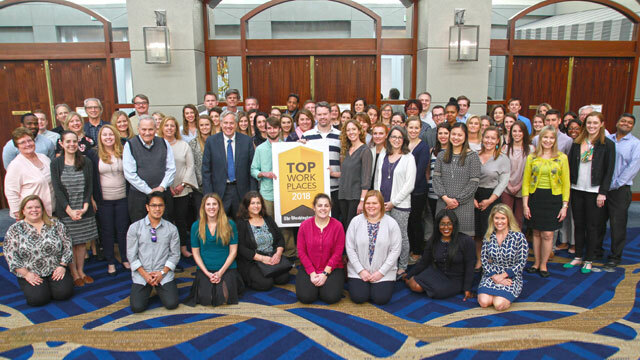 Crosby Marketing Communications, one of the nation’s leading independent communications firms, has been named to The Washington Post’s 2018 list of “Top Workplaces.” This is the second consecutive year Crosby has received this honor. The Top Workplaces recognition is based solely on employee surveys conducted by a national consulting firm, Energage. Crosby’s team of 85 employees evaluated the firm on factors including engagement, work/life balance, pay and benefits, and company leadership. Despite its rapid growth in both revenue and staff, the company has stayed true to its core values known as Crosby’s 5Cs: (1) Commitment to clients and their causes; (2) Collaboration with clients and colleagues; (3) Creativity comes from every corner of the company; (4) Continual improvement by individuals and the company as a whole; and (5) Concern and respect for others. 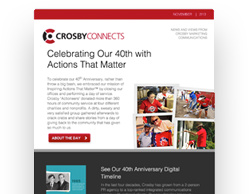 The Crosby team has established many cherished traditions, including its annual Inspiring Actions That Matter™ Day of Service. For an entire day, the company closes its Annapolis and Washington offices to participate in service projects for area nonprofit causes. Last year, the company provided 560 hours of volunteer community service in a single day and $20,000 in donations to three nonprofits.